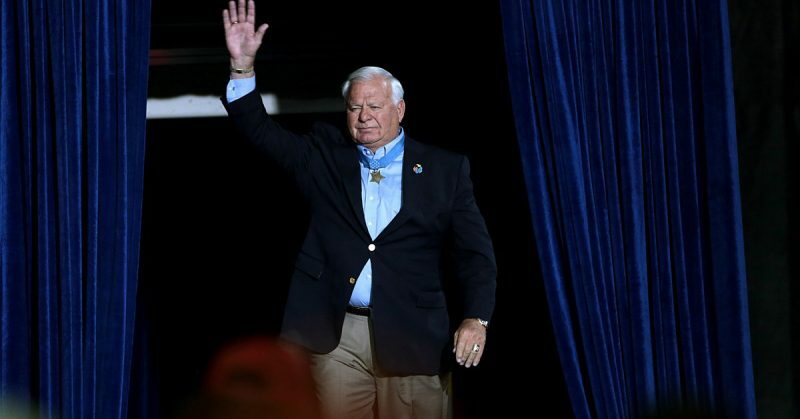 The story of the bravery of Lieutenant Michael Edward Thornton goes beyond amazing. Michael Edward Thornton, born on March 23, 1949, is a 30-year veteran of the US Navy and a founding member of SEAL Team Six. His journey on the path to extraordinary heroism began when he enlisted in the United States Navy in 1967 and served as a gunner’s mate aboard destroyers. After that, he attended Basic Underwater Demolition/SEAL training at Colorado. The training was extremely rigorous, and out of the 129 trainees who started the course, only 16 successfully graduated. Thornton was one of those 16, and he became a member of SEAL Team ONE. Ensign Michael E Thornton in dress whites, early 1980s. His first series of combat tours as a SEAL took place in Vietnam from 1969 to 1972 where he carried out a series of intelligence-gathering missions. Thornton, who was by then a Petty Officer (PO), had his moment of heroism towards the end of 1972. 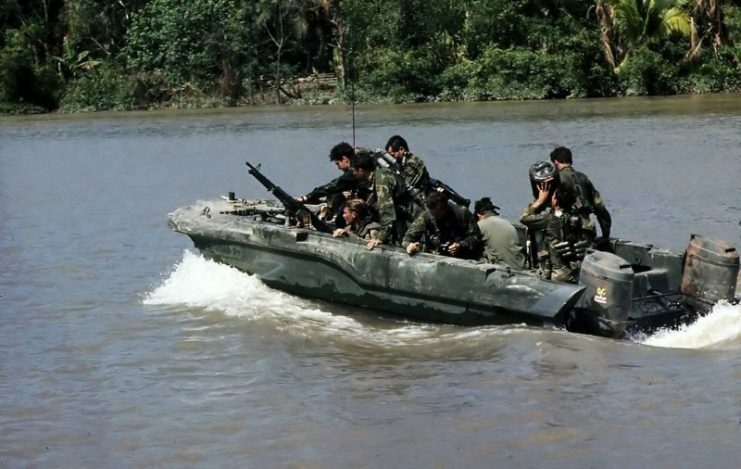 Members of U.S. Navy Seal Team One move down the Bassac River in a Seal Team Assault Boat (STAB) during operations along the river south of Saigon, 11/1967. On Halloween 1972, he and a team comprising three experienced soldiers from the South Vietnamese Special Forces and SEAL Lieutenant Thomas Norris, were on a reconnaissance expedition around the Qua Việt Naval Base, located close to the coast of Quảng Trị Province which was south of the Vietnamese Demilitarized Zone. Together with Norris and the South Vietnamese soldiers, he was sent to gather intelligence and possibly capture a few prisoners. 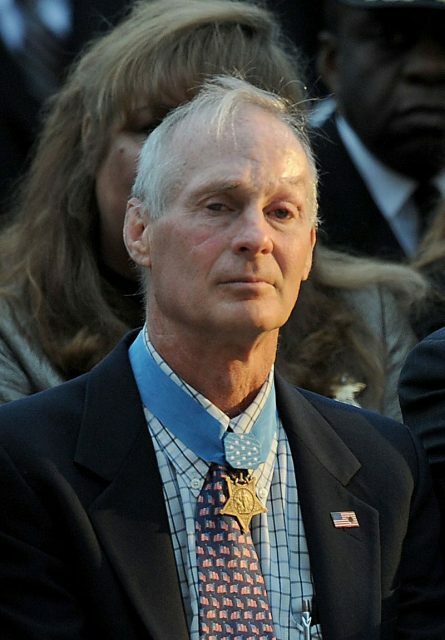 Thomas Norris, USN, at the Medal of Honor flag presentation ceremony for Master-at-Arms 2nd Class (Seal) Michael A. Monsoor at the Navy Memorial in Washington, D.C. They had been transported over the sea by a junk, riding across the water until sunset. They stopped halfway, continuing in a rubber boat which they paddled along until they were about a mile from the shore. They swam the rest of the distance and infiltrated the enemy zone under cover of darkness. All through the night, they moved inland, weaving past several enemy camps, scanning the zone for relevant information. However, they would soon find out that they had landed too far in the enemy territory and they were, in fact, in North Vietnam. There were several bunker complexes and a concentrated presence of North Vietnamese forces. Lt. Thomas R. Norris and Petty Officer Third Class Nguyen Van Kiet went behind enemy lines disguised as fishermen in a sampan to rescue Lt.Col Iceal Hambleton. As carefully and as stealthily as they could, they patrolled the territory and gathered information. However, it was not long before they encountered a two-man enemy patrol group along the beach. 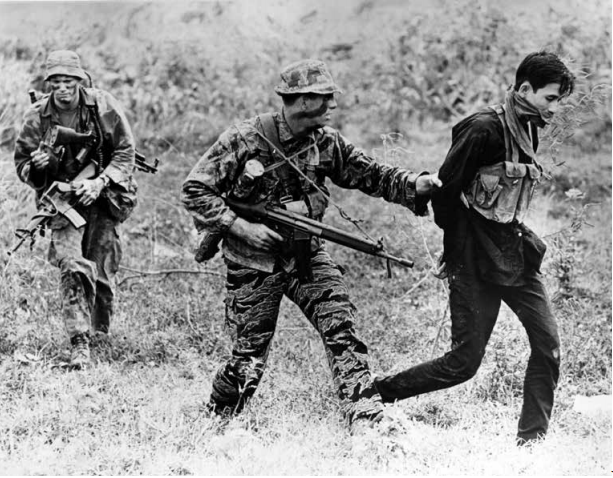 The position of these two soldiers would have allowed Thornton and his group to capture them without alerting a larger group of North Vietnamese soldiers, so they went for it. 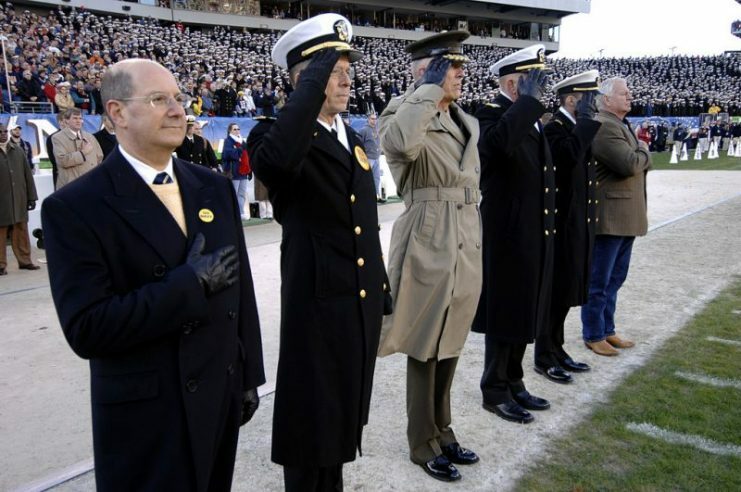 Retired Navy SEAL and Medal of Honor recipient Robert E. Thornton (far right), renders honors at the playing of the National Anthem during opening ceremonies for the 107th playing of the Army vs. Navy football game. However, their attempt was unsuccessful. One of the enemies managed to slip out of their grip, and he bolted toward the forest with Thornton on his tail. Realizing that he couldn’t catch the escaping soldier, who was yelling his lungs out, Thornton shot him down. Unfortunately, it was too late as the North Vietnamese soldiers had been alerted to their presence. Thornton was quickly spotted by about 50 soldiers, who gave chase through the woods. The team moved rapidly from one position to the next, making the North Vietnamese soldiers unsure about how many enemy soldiers were actually out there. As the night wore on, the hostilities intensified. Thornton and his unit found themselves under increasing pressure. At one point, a grenade landed near Thornton’s position. Its blast threw him to the sands, leaving him with a back injury. 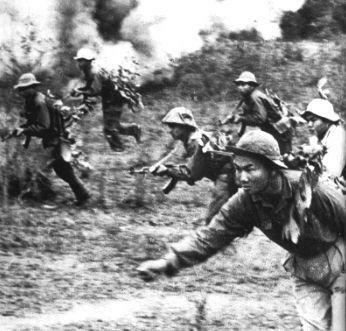 Vietnamese troops in the Vietnam War, 1967. He promptly made contact with a destroyer and requested some fire support, but this request was not granted because the destroyer had encountered heavy enemy fire along the sea and had been badly damaged. A second destroyer was also unable to come to their aid because the North Vietnamese shore batteries prevented the destroyer from getting close enough. Four hours went by with these five men constantly outmaneuvering a force more than ten times their unit size. As dawn approached, Norris ordered his team to withdraw towards the beach. He was finally able to contact a heavy cruiser which gave them covering fire as they withdrew. 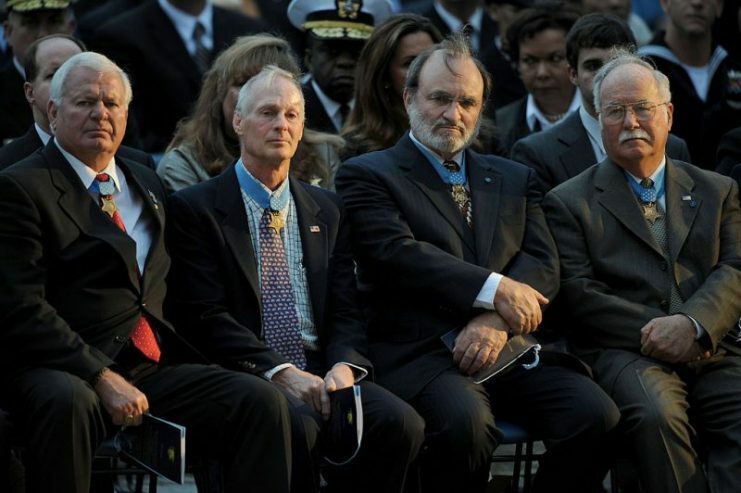 Medal of Honor recipients (from left) Michael Thornton, USN; Thomas Norris. Norris covered the men as they retreated. Having spotted a group of about 70 to 75 North Vietnamese soldiers, he prepared a rocket launcher, but a bullet hit his head, severely injuring him. The South Vietnamese soldiers who witnessed the incident assumed that Norris had died from such a devastating injury. 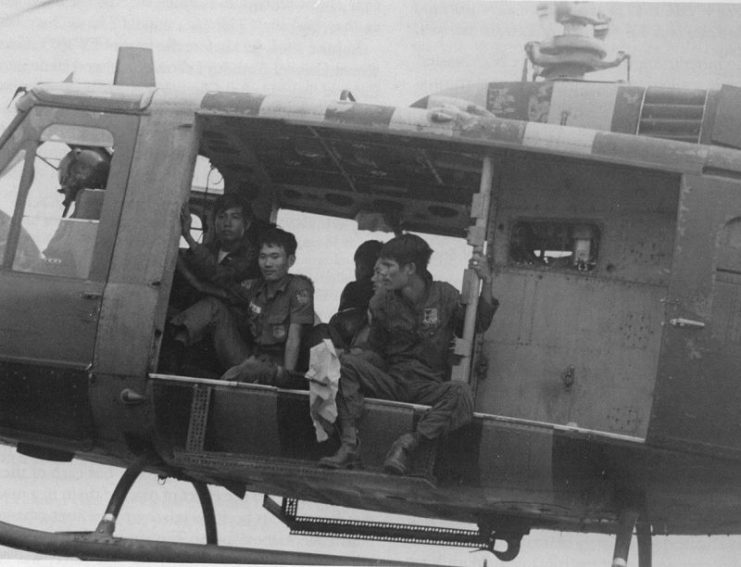 The UH-1 helicopter, shown here, could carry a flight crew and 12 soldiers. The South Vietnamese operated 861 UH-1s; helicopters totaled more than 40 percent of RVN aircraft. When Thornton was told about the fate of his fellow SEAL and senior officer, he raced 400 yards (370 meters) back to the spot where he believed Norris was. He found his comrade in a terrible state. Part of his head had been severely damaged, but somehow, he was still alive. Thornton maintained his position around Norris as he fired at a group of soldiers who were closing in. Having dispersed them, he threw Norris over his shoulder and racing back toward the beach. By then, a heavy cruiser was in a firing position. It shelled the beach, and an explosion threw Thornton high into the air. He lost his grip on Norris who was slammed against the sands a few feet away from him. Michael Thornton at the Army-Navy football game on December 2, 2006. Determined to stay alive, Thornton sprang back up and once again carried Norris on his shoulder as he raced toward the sea. Thornton made it to the surf and began to swim. There were some South Vietnamese soldiers swimming ahead of them, and he encountered one who had been shot in the buttocks and unable to swim. Grabbing the injured soldier, Thornton pulled him along with Norris as bullets rained down around them. US Navy SEALs Terry Sullivan, left, and Curtis Ashton with a captured Viet Cong in the My Tho area, 1969. For about three hours, Thornton labored through the sea with his wounded companions. One of the South Vietnamese soldiers who was picked up by the junk explained what had happened and it was believed that the two SEALs had been killed. This news was relayed to the heavy cruiser which had shelled the beach. The crew believed that the SEALs had been caught in the explosions and had died. But then the sound of an Ak-47 ripped through the morning ambiance, drew their attention and they saw Thornton floating on the sea with Norris who was barely recognizable and the South Vietnamese soldier. 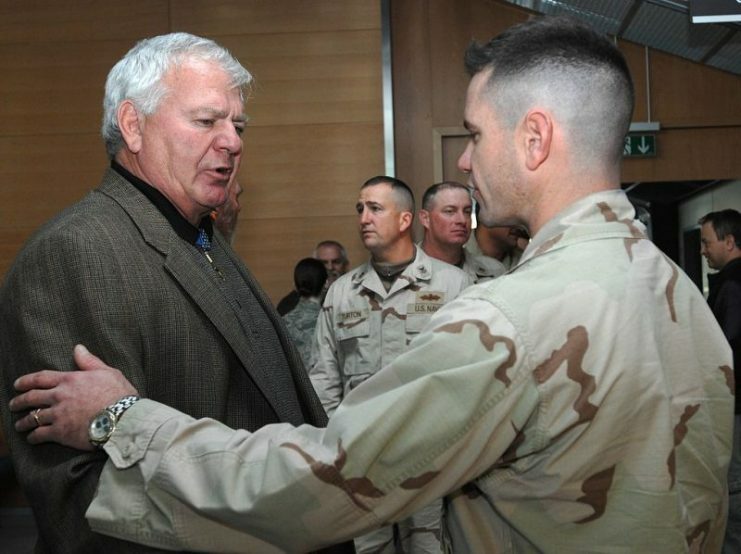 Thornton visiting troops at Ramstein Air Base, Germany, in 2008. Thornton had fired Norris’s gun to grab their attention. The junk picked them up and transferring them to the heavy cruiser. Thornton brought his wounded comrade to the operating room. It was thought that, due to the severity of his wounds, Norris would not survive. But he beat the odds. 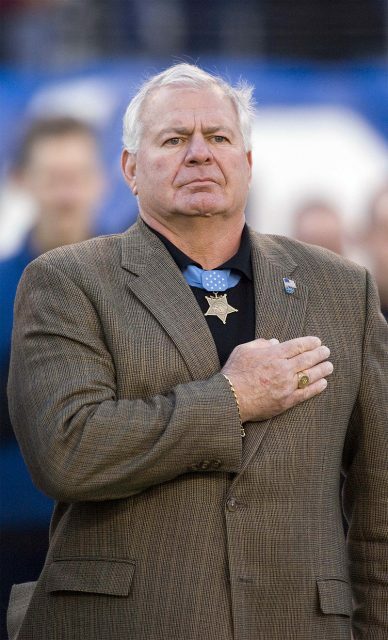 Thornton received the Medal of Honor on October 15, 1973 for his actions. 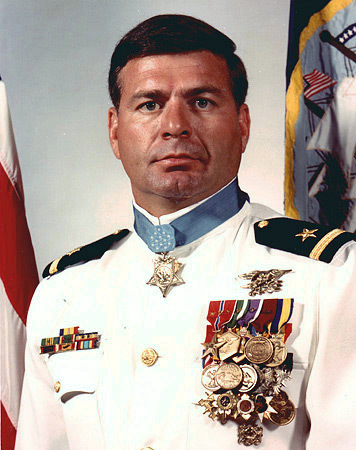 Norris was also awarded the Medal of Honor on March 6, 1976.